Matt Damon and director Paul Greengrass (The Bourne Supremacy, The Bourne Ultimatum, United 93) re-team for their latest electrifying thriller in "Green Zone," a film set in the chaotic early days of the Iraqi War when no one could be trusted and every decision could detonate unforeseen consequences. Download Green Zone in Digital HD from the iTunes store. Green Zone images are © Universal Pictures. All Rights Reserved. 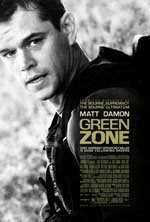 From the studio, director, and actor that gave your the Bourne series, comes their latest collaboration, Green Zone. Matt Damon and director, Paul Greengrass (The Bourne Supremacy, The Bourne Ultimatum, United 93), re-team for their latest electrifying thriller in "Green Zone". The film is set in the chaotic early days of the Iraqi War when no one could be trusted and every decision could detonate unforeseen consequences. While Universal's marketing team made every effort to depict Green Zone as an action film in the same vein of the Bourne series, I was a bit taken aback when half way through the film, I realized the seriousness and the nature of the subject matter. The film itself takes place in 2003 during the American invasion of Iraq starting with the day "shock and awe" rocked Bagdad. The film then quickly jumps into the ground action of the US Army, led by chief Miller, played by Matt Damon, showing his crusade to justify the US Army's action in the area, and why they are there to fight the "good fight for freedom and democracy". Greengrass uses his normal "shakey hand-held camera" technique for most of the film, allowing the film goer to really feel like they are right there on the front lines during the Iraqi war. The film stock that is used is very grainy allowing you to feel the chaos that has consumed Iraq since the US invasion. As far as war pseudo documentaries go, this one is top notch with true historical moments interlaced with the actions of Miller and his crusade to save the Iraqi people and do the right thing for humanity. If you were expecting a popcorn action flick for a night out at the movies, then Green Zone is definitely not the film to see. However, if you are looking for a thought provoking insight into the possible real reasons for and the reality of the Iraqi War, then I suggest you see this film -- either in the theater or on Blu-ray in the near future.